Hello Chiefs Nation! The head coaching hunt has been under way and it looks as if we may be getting Andy Reid delivered to Kansas City. That’s great news, as he is a coach with a long history in the NFL and he has a winning history. But I’m not writing today on behalf of winning, losing, stats, QB’s, or the 2013 NFL Draft. Today, we vote on a new debate. 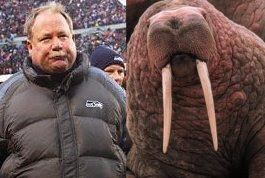 Both of these coaches are referred to as the “Walrus.” Over the years, I’ve know Mike Holmgren to be the one. Others say it’s Andy Reid. Chiefs360.com will be hosting a contest in a few weeks, the winner will receive an authentic Kansas City Chiefs FATHEAD helmet! Contest details will be announced via Twitter at the below handles, be sure to follow them for more information! Don’t miss out!